to teach your Year 11 & 12 IPT classes. IPT Online provides a complete online package of interactive textbook style notes and tools for teaching IPT (or other similar senior level IT subjects). Designed to replace both traditional textbooks and software used to teach programming, information systems, artificial intelligence and other areas of IPT. For schools administrators and teachers wishing to trial a free site license, email [email protected] with your name and the name of your school. You will be set up with a trial subscription for at least 3 months and details will be emailed to you. After your free trial expires, you can choose to continue your subscription for an annual fee of $297 per year including GST. A school subscription will give your school or organisation an administrator login to this site that will enable you to create unlimited users attached to your school or organisation (with different access levels). The site can be accessed from anywhere by your users and you will not need any hosting capabilities at your end. Updates and upgrades to the site are made automatically and therefore you are always guaranteed the latest version. Fully intergrated file manager and editor for creating PHP and MySQL websites. Using Ace by Cloud9, the file editor supports full syntax highlighting for 110+ languages. Intergrated CoffeeScript and Sassy CSS compilers. Fixed yearly rate no matter the size of your school, whether you have 6 or 60+ students. Teaching Algorithms in a interactive enviroment. Provides full sets of notes needed to complete each task RoboAnt provides an easy tool to teach algorithms. Full notes for Selecting, Inserting, Updating and Deleting data using SQL. 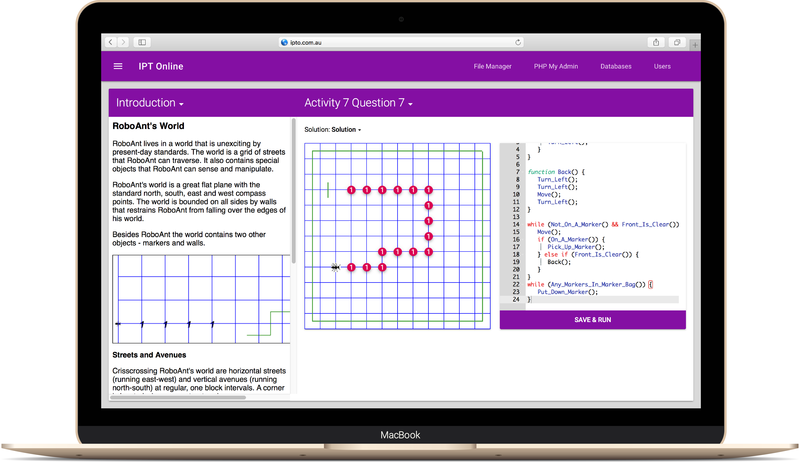 Provides basic and complex activities to test students knowledge of SQL queries. Full notes and tools for creating basic Expert Systems and Neural Networks.